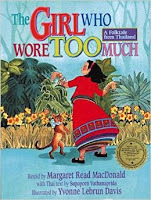 Storytelling + Research = LoiS: Thailand was Siam and Myanmar was Burma and . . . So much of a storyteller's work isn't open to everyone. Here in Michigan we have an email newsletter and related website listing storytelling programs. The newsletter is "MI Story" and the website spells it out, MichiganStorytelling.org, but when something isn't open to the public I don't list it. This past week I've been on a Thailand Trek, a cross-cultural Vacation Bible School. The program introduces children to both the Bible story and this interesting country's differences and similarities to us. As a storyteller I've had the fun of bringing both, starting with that Thai greeting, "Sawatdee", helping children experience Bible adventures, and ending the series with stories from Thailand for the entire family. but if you read the book's fine print, it isn't just from Thailand, but several countries from "the Far East." Re-reading this story I promised to tell, I discovered it's from Burma, now called Myanmar! Yes, it tells of a rivalry between the two countries, but Carpenter sets it in Burma. Prowling for sources turned up Carpenter's sources in French and an English version in Told to Burmese Children by Maurice Russell, but Carpenter's version is frankly more fleshed out. Still, it's a tale about two neighboring families and the neighboring countries and jealousy. and Thaiexchange, a site to experience many things about Thailand, including folktales. 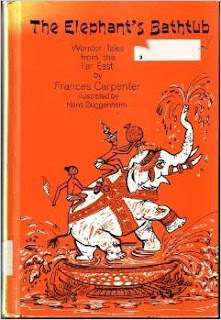 It includes "Why Elephants Have Long Trunks", a delightful pourquois tale explaining how their trunks came to be. I love stories where people come up with a creative explanation of how something came into being. But would that work in a Vacation Bible School? Maybe. We did explore creation and how our own creations use God-given abilities, but are not the same as a living, breathing elephant, bird, whatever live creature you may name. The search included several more books on my shelves, sometimes using Thailand's older name of Siam: Folk Tales from Siam - Alan S. Feinstein; The Serpent Prince; Folk Tales from Northeastern Thailand - Kermit Krueger; Siamese Folk Tales - J. Kasem Sibunruang; but there was also Burmese and Thai Fairy Tales - Eleanor Brockett; plus two more Burmese collections, The City of the Dagger and Other Tales from Burma - H.H.Keely and Christine Price and also A Kingdom Lost for a Drop of Honey and Other Burmese Folktales - Maung Htin Aung and Helen G. Trager. 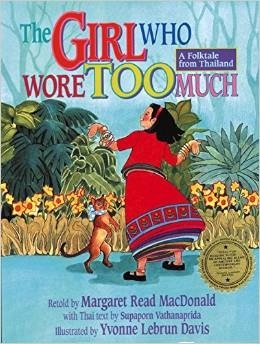 Prowling my AZZ Cardfile of my folklore books also turned up individual tales in anthologies, but it was that last Burmese book that made me think of friend and colleague, the multi-talented and well-traveled, Doctor Margaret Read MacDonald. That story is lots of fun and perfect for family audiences. Her stories frequently, including these three stories, have possibilities for audience participation. That's always a plus when the audiences stretch from preschool, to school-age, to self-conscious teen, all the way to adults. All of this prowling about had to take place in a very limited time, so I paid special attention to stories in anthologies covering more than just those two countries. Why? I figured then it had a special reason to be chosen. Similarly I figured a story in more than one book of Asian tales, like the ones already mentioned, meant they were particularly popular. The variation in titles of the same story added to the difficulty since I don't have time to read everything right now. Serpent Prince, by the way, also includes "The Girl Who Wore Too Much" but ends with its claim to a deadly truth, which MacDonald admits she softens. Thaiexchange gives "The Speech of Parrots." The same Thai story is in Harold Courlander's Ride with the Sun as "Why the Parrot Repeats Man's Words" and Carpenter calls it "The Bird That Told Tales." It, too, offers opportunity for participation. Along the way I noticed Thaiexchange mentioned their elephant story came from "the forests of northern Thailand (not even Siam yet)." Added to that The Serpent Prince; Folk Tales from Northeastern Thailand discusses the time when relations between Siam, Burma, Cambodia, and Laos were more fluid than today. This leads me to think it is not impossible that the "Elephant's Bathtub" story, which started all of this, was told in both countries, but I still need to explain we can't be certain it's a Thai tale, but certainly was caused by Siam's many "white elephants." "The white elephant flag", flag of Siam in 1855-1916. Is a white elephant white? Only nominally, as there are four grades with the lightest being a light rosy brown that is pink when wet. Both Thailand and Burma still consider them important for their rulers. A white elephant is considered sacred and doesn't work. As a result a white elephant is a dubious gift from a king because it needs plenty of care yet can't give any profit, causing financial ruin and creating the term "white elephant." Wikipedia gives a survey of the topic, including past and present, if you want to know more. In the meantime, I peeked at 2016 VBS themes possible and see that, if the Cross Cultural VBS has been successful it might look at either Norway or Egypt with a focus on the life of Joseph. 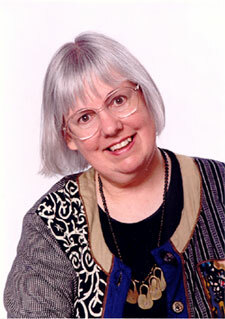 As fellow storytelling friend, Loretta Vitek, loves to say, "There's always a story, it'd be a shame not to share it!"